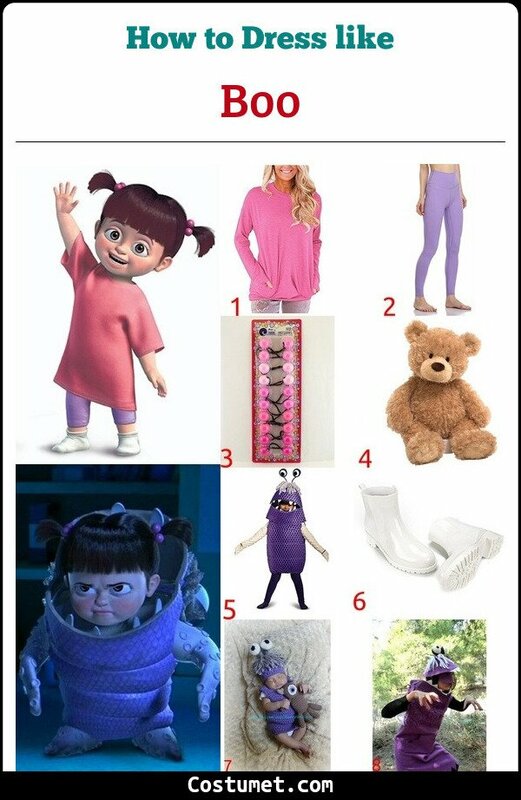 The perfect adorable little girl costume would have to be Boo from Monster's, Inc. The sweet curious girl is as innocent and as loving to monsters as can be. Her look definitely fits her character. She wears a very large pink T-shirt that envelopes her body, and bright purple leggings underneath. She also wears plain white socks, but for convenience and versatility you can pair the costume with short white boots. Another part of her costume is a cute little purple number that covers her regular clothes and lets her fit right in with the monster crowd. 1 Shirt, pink, large Boo wears a large oversize pink T-shirt that makes her look very cute. The shirt itself its very plain and simple, but on Boo it is adorable. 2 Leggings, purple Under her pink T-shirt, Boo wears bright purple leggings. Her outfit is the typical colorful look of little girls. 3 Pink, ponytail, elastics For her hair, Boo wears two cute ponytails with pink bubble ponytail elastics around them. 4 Bear, stuffed, toy This teddy bear is an important item to Boo that she loves and carries around with her always. 5 Costume, monster This little purple monster costume is what Boo wears to hide her human qualities when she goes to the monster's world. You can simple wear this over the other clothes. 6 Boots, white, short Though Boo wears socks, you can wear these white boots instead of white socks for your convenience. Boo is an adorable supporting character in the Monster's, Inc. franchise. She is a curious and adventurous little girl with a love for monsters and her teddy bear. She is accidentally brought into the monster's world and disguised as a monster herself. Throughout the Monster's Inc. series, the actress Mary Gibbs voices her. Darla would’ve been cute if it wasn’t for her creepy eyes and sinister smile. She wears a purple sweater, a yellow plaid skirt, black Mary Janes, and old-school braces.